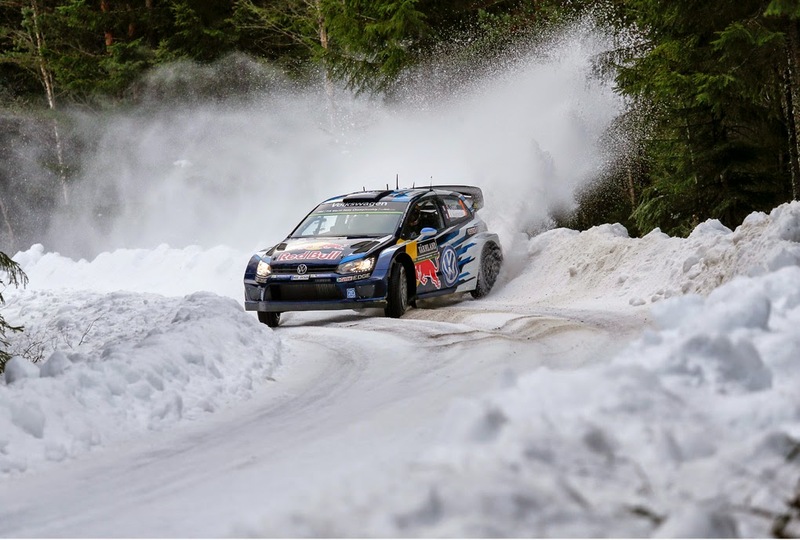 No it’s not the Snowman in 10 days, it this weekend’s Rally Sweden the second round of the 2015 WRC. At the end of the Shakedown stage today, Sebastien Ogier finished fastest ahead of Robert Kubica, Mads Ostberg and Kris Meeke. Volkswagen actually set first, fifth and sixth fastest stage times with Sébastien Ogier/Julien Ingrassia fastest (1m 59.0s) over the 4.30-kilometre ‘Råda’ stage, which was used for the FIA World Rally Championship’s (WRC) free practice. They were followed by Robert Kubica (1m 59.2s, M-Sport-Ford) and Mads Østberg (1m 59.2s, Citroen DS3) and Kris Meeke (1m 59.3s, Citroën DS3). The top drivers completed at least four runs – sometimes up to seven – with every attempt quicker than the previous run. Elfyn Evans was 8th quickest on 1m 62.1s. On the whole, conditions improved with each successive car sweeping more snow and slush from what at the start of the day were icy, snow-covered roads. The rally gets underway this evening with a 1.90-kilometre stage on the racecourse in Karlstad.